A small party of us will be doing the Thorsborne Trail from south ( George Point ) to north (Ramsay Bay) in late September. 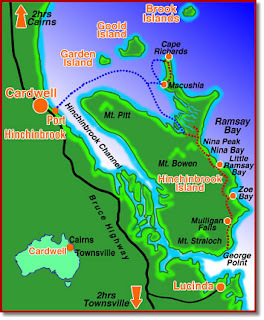 The Trail is on Hinchinbrook Island, which is midway between Cairns and Townsville, in Far North Queensland (FNQ to the locals). The map below shows the Island’s location and the Thorsborne Trail. With its lush rainforests, rugged, misty and heath-covered mountains, sweeping sandy beaches, rocky headlands, paperbark and palm wetlands, mangrove-fringed shores and extensive open forests and woodlands, Hinchinbrook Island National Park is one of the world’s most outstanding island parks. The route we are planning is opposite to the one normally taken. This was taken on the advice of a local walker, who suggests this is the nicest direction to do the walk. There is also a significant benefit that part the final day is spent at the Hinchinbrook Island Wilderness Resort . The party will be made up of Sue, Frank, Clare and Tom with Frank’s brother Ken and his son Vinnie. It will be great to have a family walk and this one does not seem too challenging. The varying levels of experience within the group will be interesting but we have planned 4 overnight stops, instead of the recommended minimum of three to ensure the pace does not have to be too hard. It is a bit of a logistic nightmare to organise getting too and from the Island. We have a long , early morning, drive from Cairns to Cardwell then a bus transfer to Lucinda to take a ferry with Hinchinbrook Wilderness Safaris to the Island. This trip is tide dependant and luckily a 10am start works that day so we should be walking easily by lunchtime. The return trip is with Hinchinbrook Ferries . They have some good information on their website including a suggested itinery for a 4 day walk. I also found this site which is part of a blog about a Dutch person’s travels around Australia. She describes the walk nicely . We have been also reading an excellent book by Steven Nowakowski who is a wonderful wilderness photographer. His fantastic photo’s can be seen in his book Hinchinbrook – A Sacred Wilderness Check out his beautiful pictures, they are worth it. G’Day Frank & Sue, just another example of how small a world we all live in. My name’s Howard and I’m the toe-sock bloke you photographed at the Wild Dog campsite @ the Walls of Jerusalem and one of the other tent owners camped across from your group. I remember you mentioning your previous Hinchinbrook Hike in September, but what I didn’t know was that you had met up with our long term friends from Maryborough, Qld who were also on a family hike. After doing the WoJ we completed a 6 day Overland Track walk in early December with the other couple, Frank & Fay and while they returned to Qld after this, Joanne and I stayed on in Tassie till just after Xmas, and taking your advice about not visiting the 2 forest reserves we’d planned to camp at west of Ballarat. The GOR was very busy as you suggested, but we did manage a good nights free camp at Johanna Beach and then made a quick run back to Bendigo to visit family before heading home to Qld on New Years Day. The surprise came when Judy, who you met on Hinchinbrook, told me about this friendly group of bushwalkers they’d met and she gave me the link to your blog. I thought I recognized your photo on the opening page, but it wasn’t until I read your account of the Walls of Jerusalem that the penny dropped. Sorry for the long post, but was hard to keep it short. We’re off to Hinchinbrook in Aug/Sept (my 5th trip I think), as acelebration for Joanne’s 50th Birthday, and we’re counting down the days. Love your “BLOG”, some very interesting reading. Howard, What a story. Great to hear from you and what an incredible coincidence that you are friends with Frank and Fay. Glad you like the blog. I am doing a post on those great Injinji socks soon. Your feet will feature! Sue was very happy with them. What did you think of the GOW? Did you check out any of the camp sites.